I am SO excited how this project turned out. I had been looking for a bench with storage for my front door. Same old story…everything was either blah or way too expensive. I saw a headboard repurposed into a bench on Pinterest, so I summoned up the determination/motivation to make one myself. 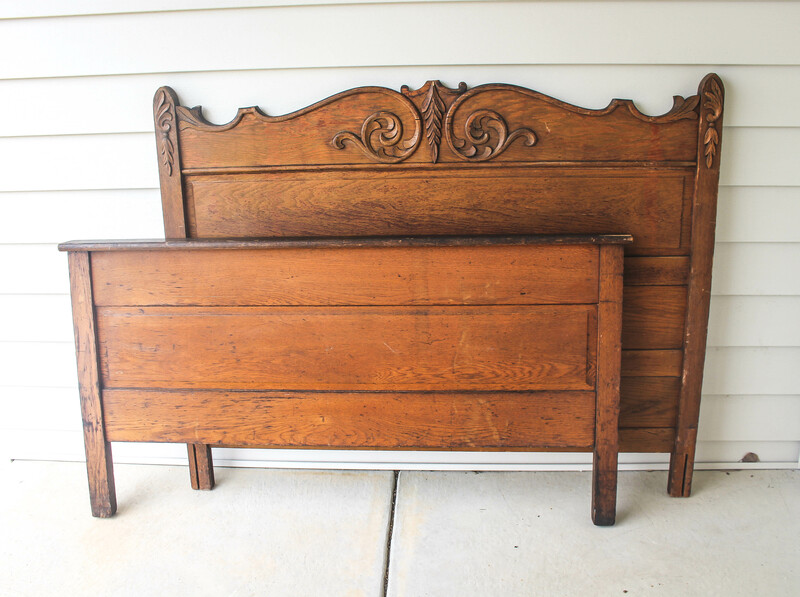 I searched for a long time on Craigslist until I found just the right headboard/footboard combo. It was so filthy when I got it, I spent a long time cleaning it with a damp sponge and used a vinegar/water mix. The fancy wooden appliques were cracked, peeling up, and some were broken off completely. I glued them down and clamped what I could. I didn’t want to take it to a professional woodworker and spend a lot of money replacing the missing pieces, so I bought some Sculpey Clay, molded my own pieces, and baked them. I glued those pieces on. Now…how will that hold up over time? I have no idea. I’m crossing my fingers and hoping for the best! Next I used a LOT of outdoor caulk to fill in all the little cracks and gaps. The bench is covered by a roof overhang, so it will get some protection from the elements. My hope is with all the caulk used and several layers of outdoor paint it will last a good long while. I’ll try to remember to update next summer! I cut the footboard in half and used each side for an armrest. I wanted a bench with storage, so I built a frame out of 2×4’s, covered it with 3/4″ plywood and used a piano hinge for the lid. Also, since the headboard and footboard are old antique wood, I made sure all the weight is on the new seat/storage area. I think I caulked, painted and retouched like 10 times after it was all said and done. Finally, I used a black outdoor stain and brushed it into all the details and wiped it with baby wipes to give it an antique look. Your posts are so amazing! 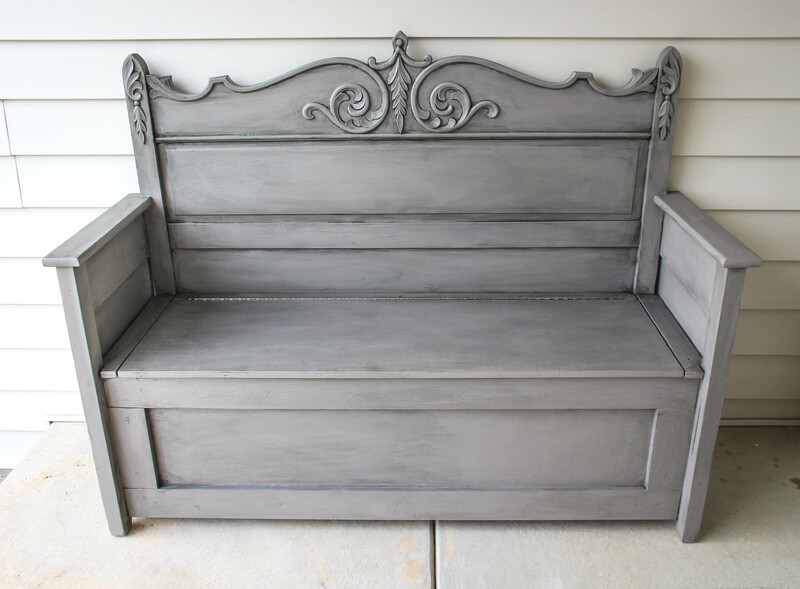 Was the black outdoor stain the only thing you used to achieve the overall color of this bench? It’s beautiful! Thank you! 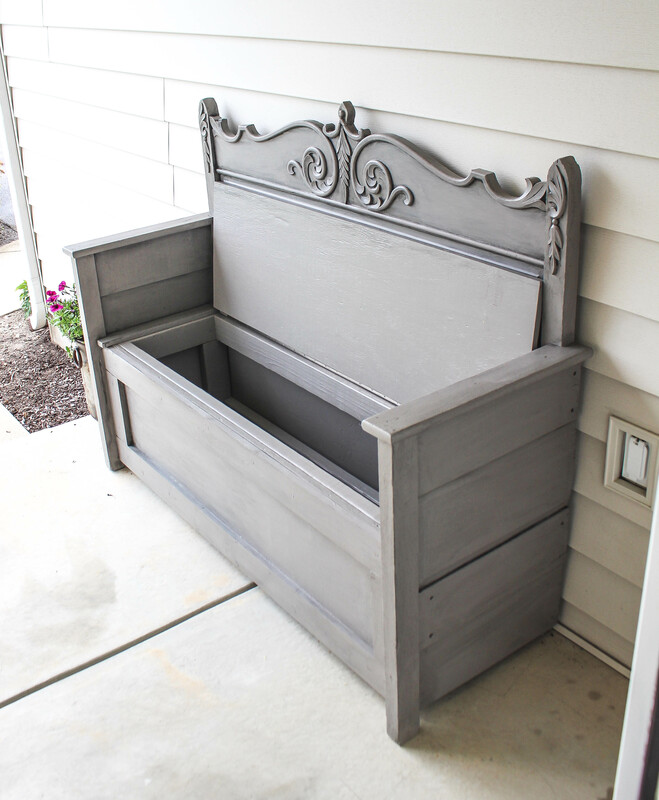 I used a solid gray outdoor paint as the main color, and then antiqued it with black stain. Just beautiful! Do you have the instructions for making the box part? Wow…..it is stunning! 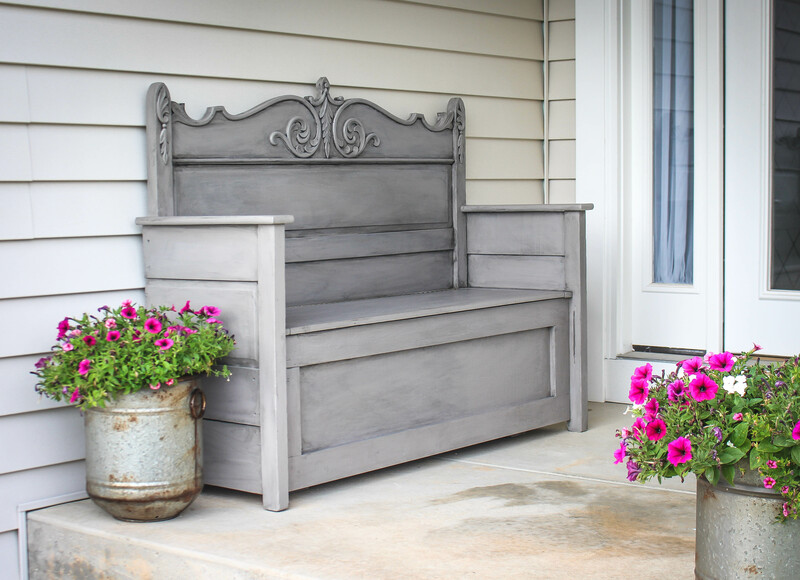 I would love to find something similar that I could use for a front porch swing. how deep did you make the bench? I’m trying to find your measurements. This is beautiful! Love this color grey.. all the greys i pick out has a blue undertone,which i hate..do u know the name of this grey? 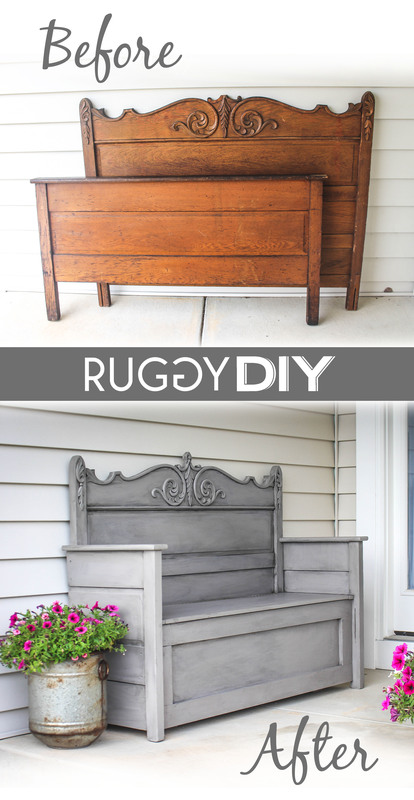 I just purchased a headboard/footboard to make my own bench. I looked through Pinterest for hours checking others ideas and pointers before starting mine. Your bench is one of my favorites so far. It is beautiful. You did a wonderful job. Wow this is amazing!! I love all the shading you did on the bench. Can you explained how you were able to get this look. Please and Thankuou!! When ever I try to do this it ends up looking nothing like your beautiful piece. So if you have any tips or suggestions I would love to here them. Thanks so much! 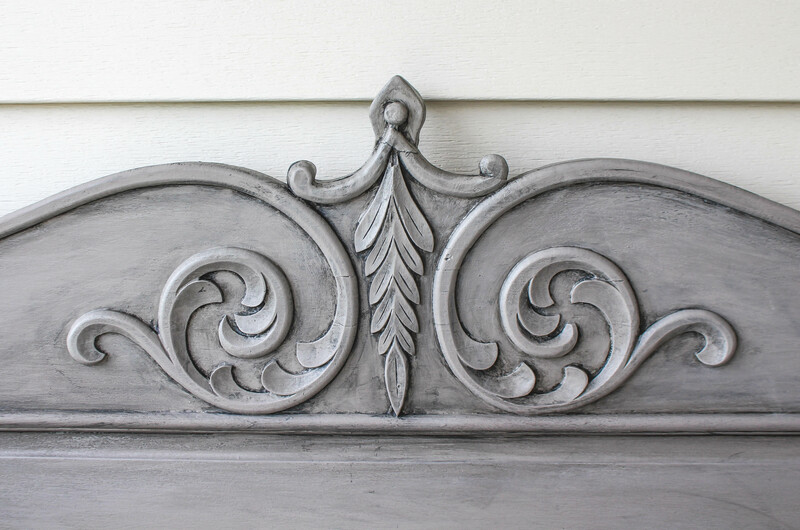 I have the exact same headboard and footboard! I have been looking for a idea on how to make a bench out of it….. I think yours is perfect! You did I great job on it. How did it hold up to the weather with the outdoor paint?